The OS X 10.9.2 beta first distributed to developers this afternoon includes Apple's FaceTime audio, a Voice over Internet Protocol (VoIP) feature that was originally introduced to the iPhone with iOS 7. With FaceTime audio on both iOS and OS X, Apple users will be able to seamlessly call one another from any device. 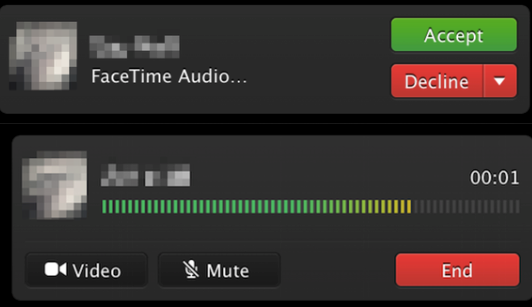 FaceTime audio is designed to allow users to initiate voice-only calls with other FaceTime users without turning on the accompanying video feed. Currently, Macs running Mavericks only have access to the standard FaceTime app, which bundles both video and audio. Users who are interested in voice-only communications on Macs have to resort to using third-party apps like Skype or switching to Messages, both of which allow for video chats and voice-only chats. According to 9to5Mac, the FaceTime audio feature is "integrated deeply" into both the Messages and FaceTime apps, making voice communication between Apple users on any device easier than ever. With Messages, FaceTime, and FaceTime audio on iOS and OS X, Apple will have a complete communication system in place. With a simple way to answer telephone calls and chat requests from all devices, those in Apple's ecosystem will have little reason to resort to alternative VoIP apps when communicating with other Apple users. FaceTime audio is also a high-quality VoIP choice, as it uses the AAC-ELD codec for Full-HD Voice. AAC-ELD is designed to provide CD-like audio quality for voice calls, delivering high speech and audio quality at a low coding delay. It is unknown when OS X 10.9.2 will be released to the general public, but OS X 10.9.1 was in development for just over a month before it was distributed earlier this week. While Apple has been known to remove beta features ahead of release, it is likely FaceTime audio will make it to end users as it is already available on iOS. I fail to see how this is going to be practical when Facetime is not open. Can't use it with my wife because she has an Android phone. Its stuff like this that gives the carriers nightmares! And for that I will forever be grateful to Jobs for giving the power back to the people! It was a bad move renaming iChat. FaceTime was never a great name and it's even more awkward now. I love FaceTime Audio! So long Skype! FTA is worth the cost of the Apple ecosystem by itself. They should just call it VoiceTime. Great! And speaking of deep integration, let's have a Messages app update on OSX. It looks so outdated now that I'm used to iOS7! Don't get me wrong it is good that this is addressed but I don't really know who would extensively use this apart from one or two friends. - If both checks are positive, FaceTime Audio call is initiated. If either of the checks fail, the call defaults to via carrier. This would provide a seamless experience, and get consumers to truly appreciate the HD quality FaceTime audio requires, whilst simultaneously raising a middle finger to cellular carriers. 1. That's great. I've been wanting this. 2. Can it please be a part of Messages? It's weird that I have one app for IM and the AOL/.Mac/MobileMe/whatever video and audio chat then another just for FaceTime. but what about conference calls? adding this feature will send Skype to the graveyard. This too. But to kill Skype, FaceTime has to go cross-platform.